It’s the 62nd century, and civilisation has since moved into deep space. 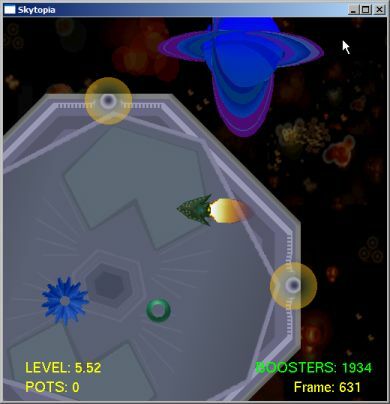 Free of the old worries of poverty and work, man has built various futuristic high-tech games near the Zydonia solar system - of which one game - AstraGrid - remains a firm favourite. Records are rarely broken in this game. Legend has it that someone reached level 8.2 with a total of 93 successful pots, but unfortunately this was a practise run, and was not officially recorded. Now is the time for YOU to play the game. Can you master the subtle strategies needed to survive long enough to beat the record? Only practise and sheer determination will see you through, and only the very best game players are up to the challenge. Download, and just unzip the contents and double click on "AstraGrid.exe". 1: Always try and stay close to the disc so that the grid guardian can’t reach you! 2: You don’t always need to aim the disc at a pocket. Aim it at the enemy to push it away for a vital second! 3: Use boosters sparingly when you’re in a sticky situation. 50 extra boosters can be gained after each pot. 4: Use the ‘k’ key to flip direction - great for when you’re just about to veer off the edge! 6: Try to judge what direction the disc comes out of a pocket, and be there for it to score a double whammy! 8: Bear in mind the rotation of the sub-platform when taking your shot. Sometimes it can lead you into trouble! 9: Use ‘i’ and ‘o’ together for a double boost even more powerful than the normal boost! 10: If you have enough thrust, sometimes you can recatch the disc after firing to have an easier second shot! Most of all: Don’t give up! If you reach level 5, for a while, things will become easier - you have powered up! AstraGrid is copyright 2005 onwards Daniel White. If you wish to use the game for commercial purposes, you must contact me for permission.